Just found your comics today and I must say it really impress me. Your art is easily distinguish and full of details, storyline so far full of tense and you update 3-4 times a week. You can draw violence in a natural fairy way (odd words to type) and your coloring is incredible dreamy. You brink me back memories, when I read Elf ´n troll, and then discovered the artists quit them. So don´t you dare to join him and somehow give it up! The time, when your comics will have bazilions of fans, and your site will unconquered rule TWC ranking is not far away. I am a good friend with a.p.furtado who wrote and illustrated elf n' troll I was sadden as well when he had to stop. Yet I understand why as well. It's hard for web comic illustrators to make a living on a product they give away for free. It actually is a labor of love, yet one has to eat first and pay rent, which is why we encourage people to visit the store and support the artist they enjoy. I have been talking though with a.p. lately and trying to encourage him to get back into the fray- we will see. I love his work as well, hopefully he will reconsider. Also didn't notice that this was the latest page. on the one hand, yay, I'm caught up, but on the other hand, now I have to wait for more! Well, you're really good with the details, so we have to pay attention 🙂 You did a great job of making that an important detail on this page, without making it so overt that it distracts from the scene overall. …Actually, I didn't. Thanks for pointing that out! 😉 Definitely a good thing to notice. 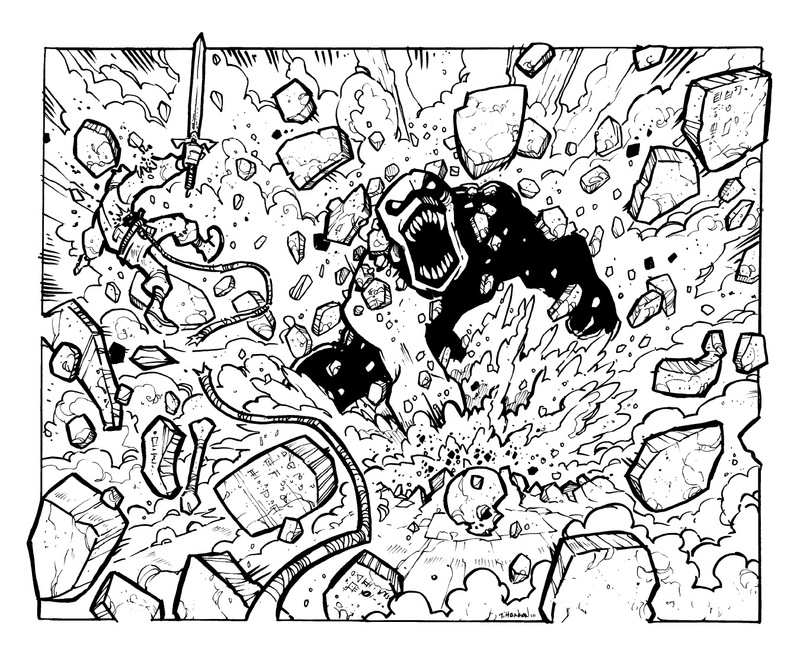 This 1-panel page is explosive! WOW! This is so, SO awesome! Now Bean's gonna HAVE to use that sword !!! I just found this comic today…and I am hooked on it!!! I saw that some of the other poster have mentioned some sort of books? If these books pertain to this comic let me know, keep up the good work. Ah… looks like we get to find out how well that sword is going to work for Bean! Been a dA lurker of yours for some time, bought the books and now am caught up to the comic version. As always, I am strapped into this rollercoaster ride! Love the new look to the site and all of the functions you have added for readers to interact. Look forward to the next posting! 🙂 yay da lurkers – 🙂 glad your here and I hope you've enjoyed the tale in the books. I would hope you take a moment to add a review at the store site on your opinion of the books.